And as I sat there stewing, I also was thinking. None of this stuff – anthems, flags, standing and removing your cap “to honor America” – none of this really moved me. Because I do not consider myself an American. Go read the rest — it’s really good. Someone needs to give eugene a time-turner so he can write stuff here, and at MLW, and be a grad student all at the same time. As regular readers of this blog know (and most disagree), I’m an American exceptionalist. In common parlance, and with no hyperbole, that means I think America is the greatest country in the history of the world. But I don’t view eugene’s opinion as a disagreement with me. Rather, I read it as a symptom of just how far this country has fallen from the Progressive ideal it once brushed against. Follow me over the flip, and I’ll explain where I’m coming from. …It goes much deeper for me, at least, than a mere rejection of jingoism. I don’t consider myself an “American.” I don’t buy into national identities. If you held a gun to my head and made me choose, I’d claim to be a Californian, never an American. It’s not that I dislike other Americans, though there are many who I cannot stand. It’s that I believe the process by which we as humans separate ourselves by creating supposedly essential identities – be they racial, cultural, religious, or political – is not just flawed, but corrosive. If there’s any thinker of whom I can be said to be a follower, it’s Herbert Croly. A journalist and founding editor of the New Republic (yeah, I know), Croly’s 1910 opus, The Promise of American Life, was the chief inspiration behind Theodore Roosevelt‘s historic 1912 Presidential campaign on the Progressive ticket. 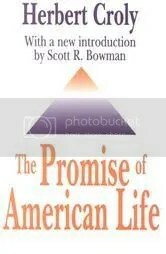 In the book’s opening chapter, What is the Promise of American Life? — which can be read as a stand-alone summary of the book’s premise — Croly sketched out the beginning of American exceptionalism: a difference in the way Americans and those from other nations experience nationalism. Croly’s prose reads like a truck, but it should be read in its entirety: like a brick wall, it builds up layer by layer to an inescapable, and brilliant, conclusion. … There are significant differences between the faith of, say, an Englishman in the British Empire and that of an American in the Land of Democracy. The contents of an Englishman’s national idea tends to be more exclusive. His patriotism is anchored to the historical achievements of Great Britain and restricted thereby. As a good patriot he is bound to be more preoccupied with the inherited fabric of national institutions and traditions than he is with the ideal and more than national possibilities of the future. This very loyalty to the national fabric does, indeed, imply an important ideal content; but the national idealism of an Englishman, a German, or even a Frenchman, is heavily mortgaged to his own national history and cannot honestly escape the debt. The good patriot is obliged to offer faithful allegiance to a network of somewhat arbitrary institutions, social forms, and intellectual habitson the ground that his country is exposed to more serious dangers from premature emancipation than it is from stubborn conservatism. France is the only European country which has sought to make headway towards a better future by means of a revolutionary break with its past; and the results of the French experiment have served for other European countries more as a warning than as an example. The higher American patriotism, on the other hand, combines loyalty to historical tradition and precedent with the imaginative projection of an ideal national Promise. The Land of Democracy has always appealed to its more enthusiastic children chiefly as a land of wonderful and more than national possibilities. 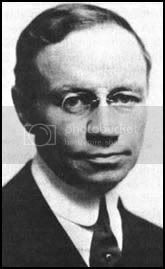 “Neither race nor tradition,” says Professor Hugo Münsterberg in his volume on “The Americans,” “nor the actual past, binds the American to his countrymen, but rather the future which together they are building.” This vision of a better future is not, perhaps, as unclouded for the present generation of Americans as it was for certain former generations; but in spite of a more friendly acquaintance with all sorts of obstacles and pitfalls, our country is still figured in the imagination of its citizens as the Land of Promise. They still believe that somehow and sometime something better will happen to good Americans than has happened to men in any other country; and this belief, vague, innocent, and uninformed though it be, is the expression of an essential constituent in our national ideal. The past should mean less to a European than it does to an American, and the future should mean more. To be sure, American life cannot with impunity be wrenched violently from its moorings any more than the life of a European country can; but our American past, compared to that of any European country, has a character all its own. Its peculiarity consists, not merely in its brevity, but in the fact that from the beginning it has been informed by an idea. In Croly’s calculus, and mine, the essential devotion of an American patriot is to an idea. That idea, of course, is freedom — the liberty to participate in one’s own government and to take an active role in its creation and administration. A true American “nationalist” would rather see his country’s sovereignty taken away than halt the worldwide ascendance of democracy. (As an aside, my views on this explain what I despise about the sort of misguided patriotism that has pervaded America since September 11.) This feature of the American character is absolutely unique in human history; the only possible counterpart to American idealism was China in the brief but heady days after Chiang Kai-Shek fell, and before a thousand flowers bloomed and died. We create hard and fast identities usually to lay claim to power. We do this by defining ourselves as “us” and others who we wish to disempower as “them.” We have many ways of accomplishing this – dissing on others’ cultural habits, trying to use the law to classify 12 million people as “illegal” and therefore without rights, etc. But this act of differentiation always brings consequences, especially when dealing with the formation of national identities. Some people are “in” and therefore privileged, others are “out” and therefore disempowered and free to have all sorts of violence visited upon them. Sure, we have classifications and tiers of other nationalities, often based on race, but that doesn’t change the overall dynamic. Not so in Croly’s worldview. The Progressive thinker insisted that American “differentiation” was not between in and out, but between selflessness and selfishness. From the point of view of an immigrant this Promise may consist of the anticipation of a better future, which he can share merely by taking up his residence on American soil; but once he has become an American, the Promise can no longer remain merely an anticipation. It becomes in that case a responsibility, which requires for its fulfillment a certain kind of behavior on the part of himself and his fellow-Americans. And when we attempt to define the Promise of American life, we are obliged, also, to describe the kind of behavior which the fulfillment of the Promise demands. So the core of Croly’s nationalism, then, is not in a desire for power, but in a need for civic engagement. Croly takes an age-old notion, that more citizen participation in government equals better government, and takes it to a new level: he postulates that it is not only the right, but the solemn duty as a patriot, of every American to participate in the workings of her political system. Patriotism, then, becomes manifested in the work we do for others, in the energy with which we spread and further participation in government; the National Anthem rings not as a gloat but as a call to action, to the betterment of our nation and of society as a whole. I think it is ultimately necessary during this century to abandon national identities in favor of a human identity, in order to create the sort of global political movement that is essential to the reconstruction of our freedoms and economic security. In my opinion, the path to global harmony cannot be found by abandoning our American identity, but by celebrating it — because in the final analysis the American idea is bigger and more all-encompassing than America the nation. America the idea — the synonym for democracy, evangelism, and an engaged citizenry — has applicability to the whole soul of the world. It is an ideal we should seek to make universal, even if in doing so we compromise our own geopolitical ascendance. America needs to be the dream of the world, not the master of the world; indeed, in an ideal society, America as a nation would have no need to exist at all. And the Crolian ideal of America is why I advocate transformational leadership as a nationwide restorative for the American soul. Every reach for the stars of the political sphere is a brush with that idea of universal participation in government that is the driving force of Croly’s work. For him, as for me, America exists only as a vehicle for the idea of democracy; it is important only as a bee is important, its job to pollinate democracy from fertile flower to fertile flower. As Croly would have it, Democracy “becomes, in that case, a responsibility’ — an unending project in which all Americans ought to take part. Only then can we truly fulfill the promise of American life. This entry was posted on Saturday, October 6th, 2007 at 7:51 pm and is filed under Uncategorized. You can follow any responses to this entry through the RSS 2.0 feed. Responses are currently closed, but you can trackback from your own site.